Nestled below the tourist hotspots of Oaha and Maui is the hidden pearl of the Hawaiian islands where nature can be seen and experienced at its purest. The charming seaside town of Kailua-Kona is located on the island of Hawaii also known as “The Big Island” which is the largest of the islands. One touch of the Kailua-Kona white sandy beaches on your feet will instantly send the magic of Hawaii straight to your soul. The air is a blend of sweet tropical flowers, sugar cane, and a crisp ocean spray. Kailua-Kona is an experience itself. The untouched, lush tropical forests and proximity to spectacular waterfalls and vistas cultivate an essence of life that feels refreshing. The hiking trails in Kailua-Kona offer close-up views of diverse vegetation and wildlife, and jaw-dropping waterfalls you can jump into. On the Kilauea Iki trail you can venture through lush tropical forest and even see some plumes of volcanic steam. Shop at the fantastic boutiques or enjoy delicious, memorable Hawaiian dining around town. Kailua-Kona offers a rich source of enjoyment that caters to all tastes and interests. Kailua-Kona’s proximity to the untouched beauty of the Big Island of Hawaii make staying at the Kona Reef Resort one that is simply captivating and comforting to retreat back to. The spacious 2 bedroom condominiums make the perfect haven to unwind and relax in. Footsteps away from the beach, barbeque areas, and a party pavilion to hold luaus, Kona Reef Resort is the perfect place to discover and experience an invigorating blend of life. Gaze out into the deep blue beaches of the Kona coast or the lush Kona Reef landscape from your private one-bedroom suite, providing 860 sq. ft of space where you can retreat and relax after days under the warm Hawaiian sun. Suitable for up to 4 persons, this ultimate Hawaiian getaway is perfect for couples spending a honeymoon in Hawaii, a family vacation, or groups of friends. 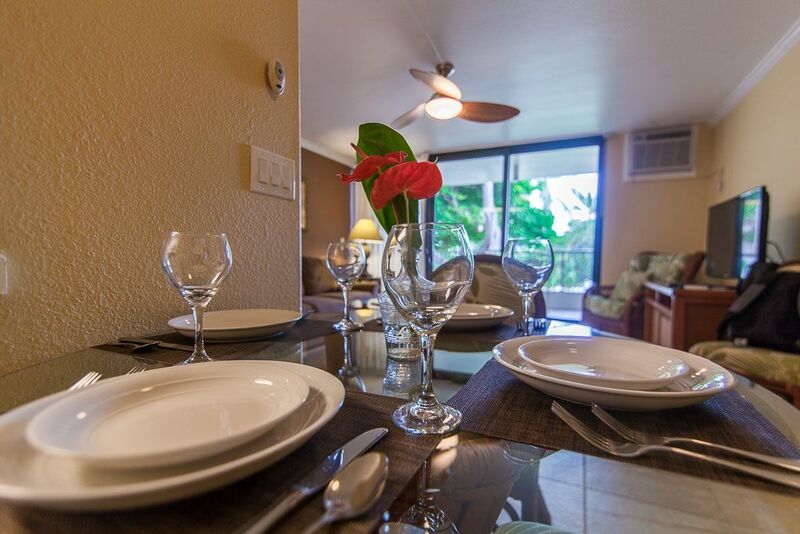 The facilities at Kona Reef Resort provide what you need to enjoy a relaxing day or some quality time with loved ones without having to leave the resort property. Enjoy barbeques with friends and family, sunbathe on the sundeck or splash around in the swimming pool. Whether you would like to have a relaxing afternoon in the sun or would like to throw a party, we have all you need within steps of your suite.